Our fire extinguisher programmes include open courses, in house training and also online sessions. We also provide on site fire extinguisher and general staff training courses. Open courses are held every month and include live fire extinguisher sessions. We use an LPG training rig and extinguishers, so all of your staff can practice putting out small fires on our courses. London open courses dates can be viewed on this site and also our sister website. In house staff fire extinguisher training courses can be held at your site. The courses can also include a live fire extinguisher training session. We do need an appropriate outside space and limit the numbers taking part to about 20 persons. Managers can either call or email us for more details about off site fire training. Online fire extinguisher courses can be carried for individuals and also as workplace specific websites. This means workplaces get their own website that only their staff can access. Managers can also opt to purchase an in house fire extinguisher training course and then add an additional 3 year access to our online programme. Either call us or email us for details about this offer. Our team can travel to your workplace and carry out training at any time of the day. We do not offer live extinguisher training for safety reasons. Remember, any number of persons can take part in a classroom session. Many managers have high number of staff who need training. We can provide sessions throughout the day to ensure that you train all of the persons in your workplace. 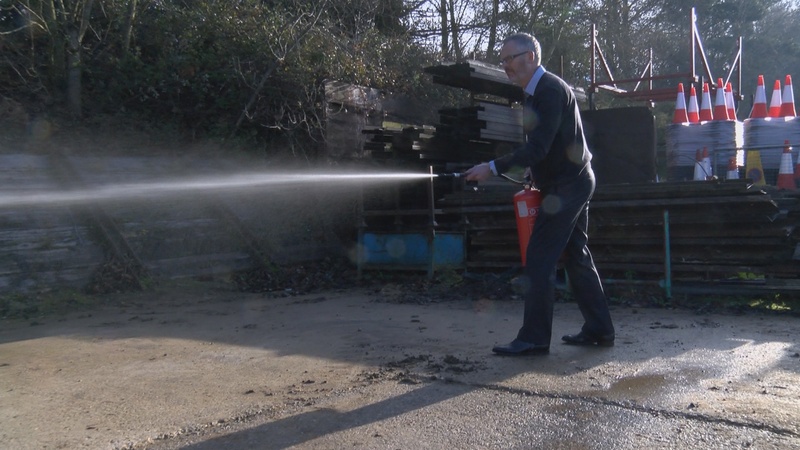 We offer fire training that includes the use of extinguishers for different workplaces. For example our care home and school courses both include extinguisher training. In addition to London courses, we also offer fire training in other locations.